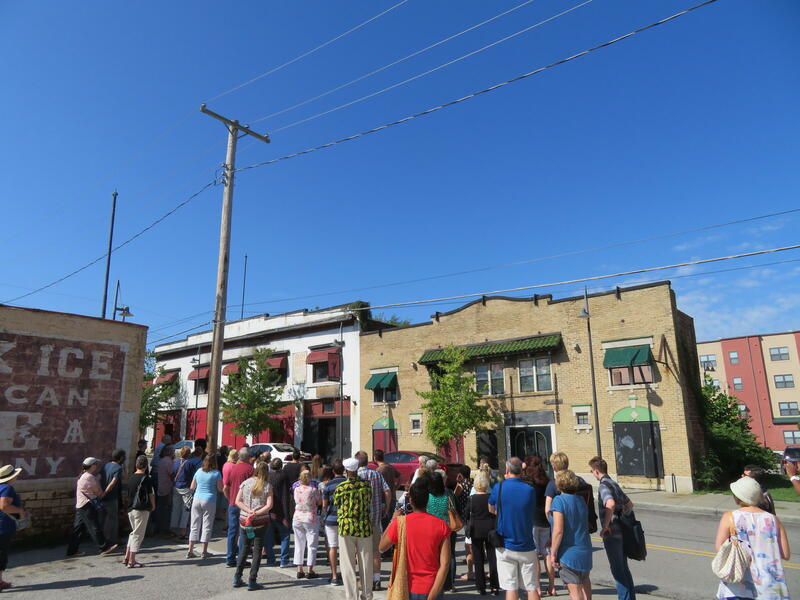 About 75 people attended a tour of the Historic 18th and Vine District as part of Kansas City's annual Charlie Parker Celebration. They stopped across the street from the former Eblon Theater at 1822 Vine. 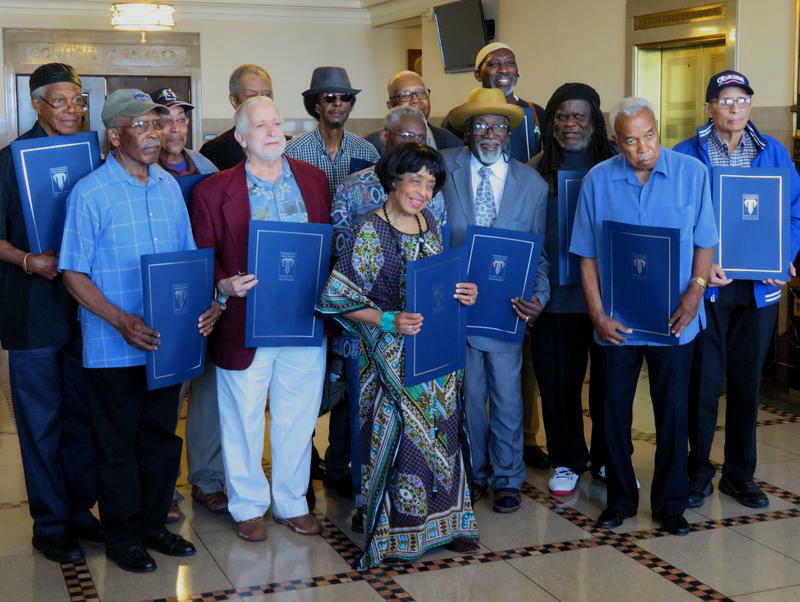 Events include musical performances, panel discussions and the longstanding annual 21 Sax Salute at Parker's grave in Lincoln Cemetery. And for the second time in as many years, the Charlie Parker Historical Tour. 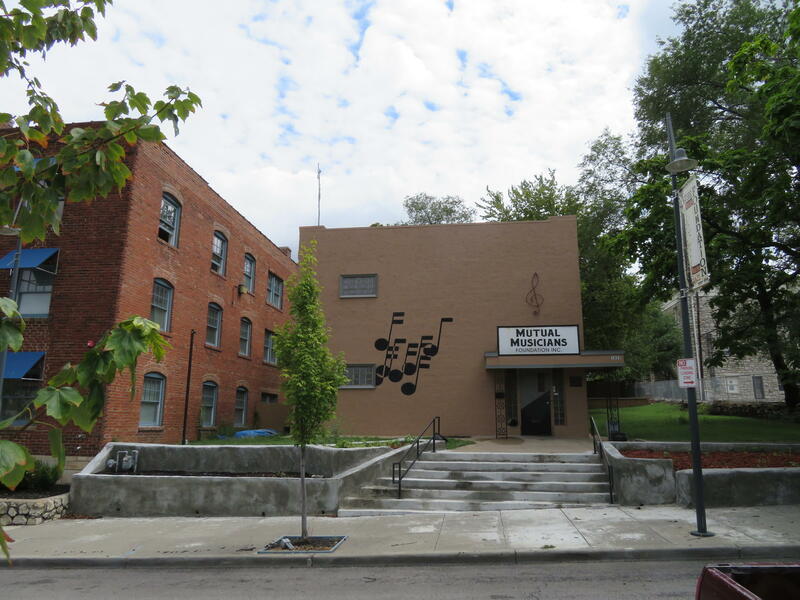 Led by Chuck Haddix, head of the University of Missouri-Kansas City's Marr Sound Archives, author of Bird — The Life and Music of Charlie Parker, and host of KCUR's Fish Fry, the tour on Saturday visited places in and near the historic 18th and Vine District. About 75 people bought tickets. Among them was David Efros, a Parker fan from Detroit who was visiting his daughter in Lawrence. "I was moved," an emotional Efros said after the tour. "I'm a history buff, and I like to see in my mind how it was happening. I was imagining it." On Friday and Saturday nights in Parker's time, students from nearby Lincoln High School gathered to socialize and dance to live bands on the third floor of the Lincoln Building at the southeast corner of 18th and Vine. 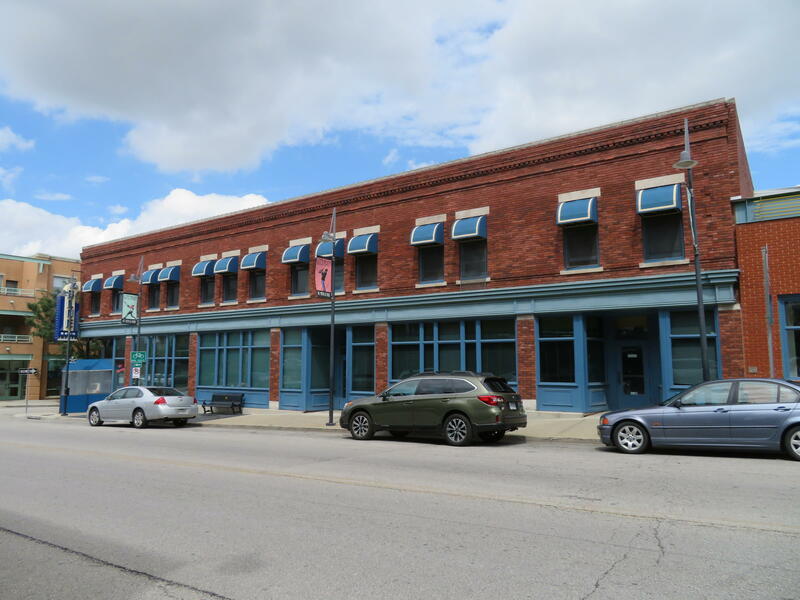 The third floor of what is now known as the Historic Lincoln Building, on the southeast corner of 18th and Vine, had a dance hall for high school students. At 1610 E. 18th Street, the El Capitan Club was popular with jazz fans. Parker often played there when he was in town visiting his mother. What used to be the El Capitan Club is somewhere in this block now occupied by the Blue Room and the American Jazz Museum. In June 1940, Step Buddy Anderson introduced Parker to Dizzy Gillespie near the barbecue and jazz joint that once occupied 1516-18 East 19th Street. 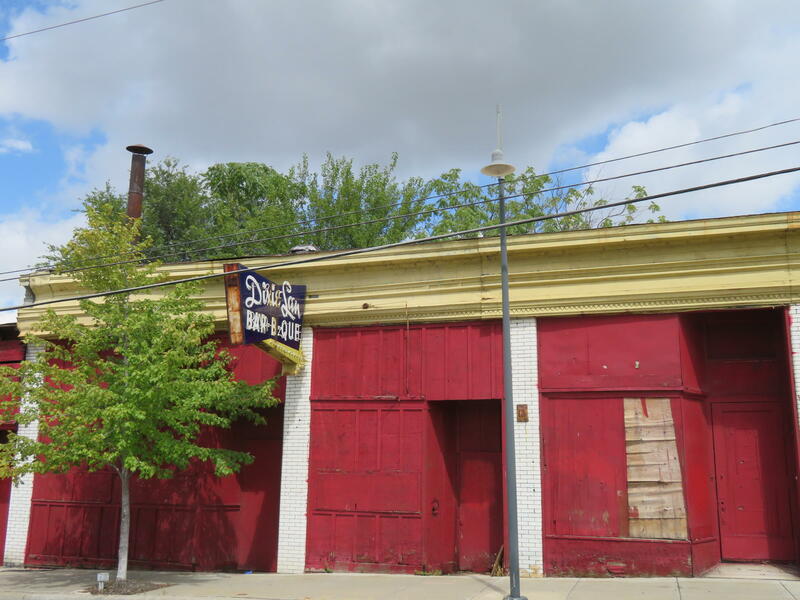 The site of the former Ol' Kentuck barbecue-and-jazz joint, on 19th Street between Vine and Highland, was apparently once also home to Dixie Lan Bar-B-Que. 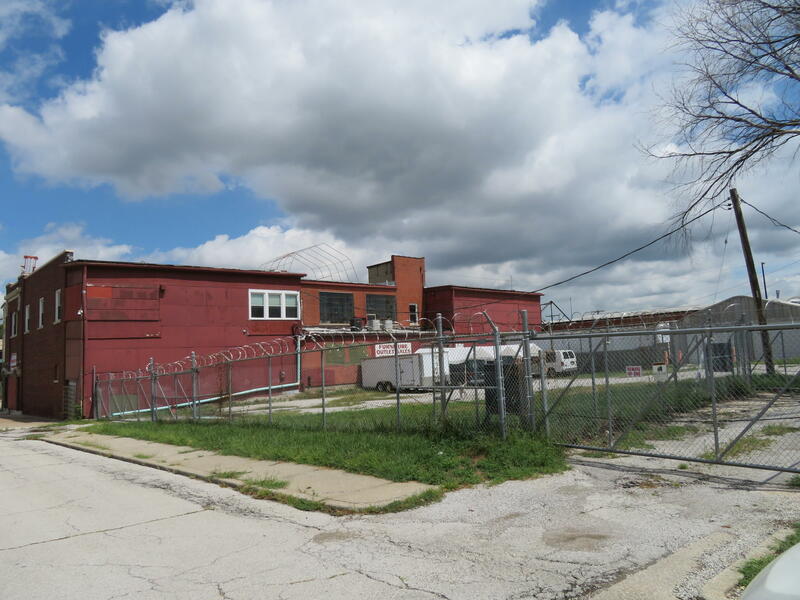 The Local 627 Colored Musicians Union was established in 1917; union members later bought their hall at 1823 Highland, one of two National Historic Landmarks in Kansas City (the other is the Liberty Memorial). Haddix: "Parker joined the union in 1935 and was suspended for not paying his dues in 1945. He transferred his membership to the national union." 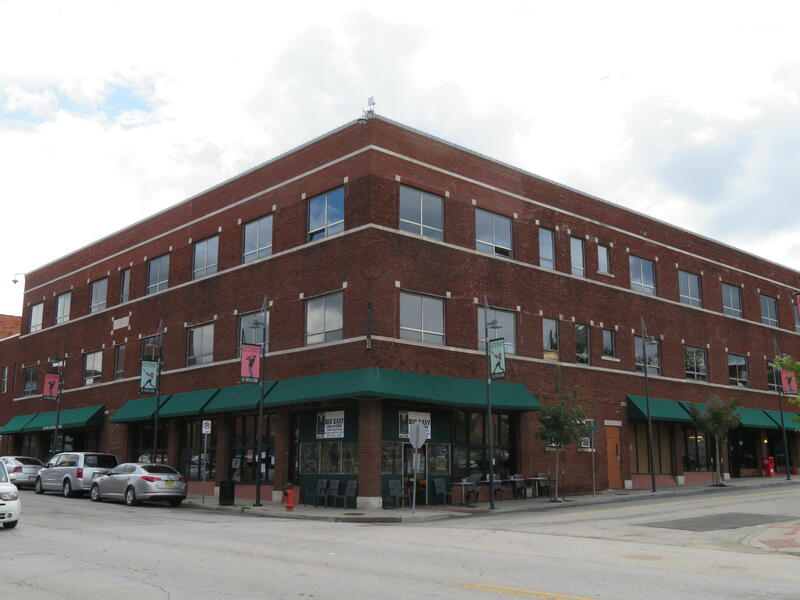 The Mutual Musicians Foundation at 1823 Highland is one of two Kansas City sites to be designated National Historic Landmarks. The charismatic Lucille Webb engaged patrons at her namesake club at 1711 1-2 East 18th Street while her husband S.D. ran the kitchen. In 1938, Parker had regular gigs here with alto saxophonist Buster Smith's band. Haddix: "Onstage, Smith mentored young Charlie, teaching him how to go in and out of key and play double time. An eager student, Charlie could soon improve on anything that Smith played." 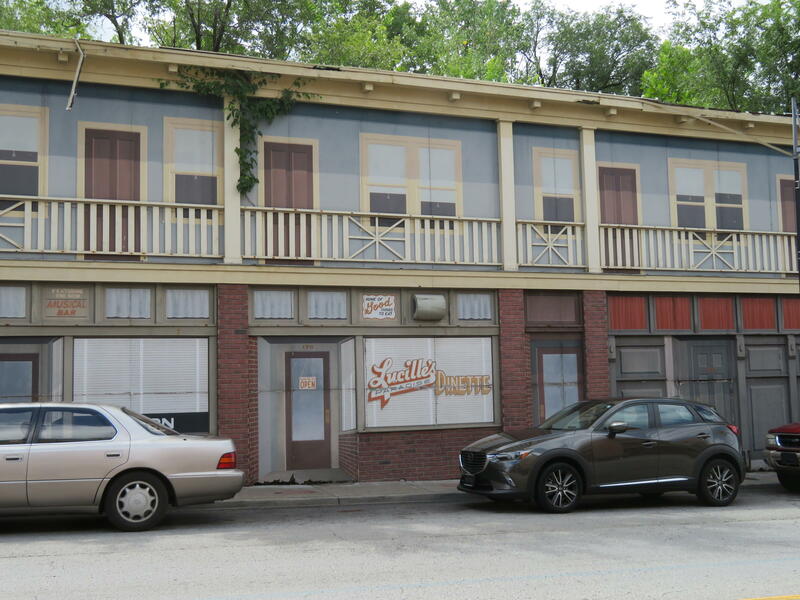 A painted facade depicts the legendary Lucille's. This rambling structure at 15th and Paseo is now St. Stephen Baptist Church. Haddix: "In 1924, Bennie Moten reportedly leased the then-Paseo Dancing Academy, making it available to 'colored people' for the first time. Moten, Duke Ellington, Fats Waller, George E. Lee and others played for as many as 1,500 dancers. Parker played here with his Chords of Rhythm on Halloween 1935 and again in December that year." 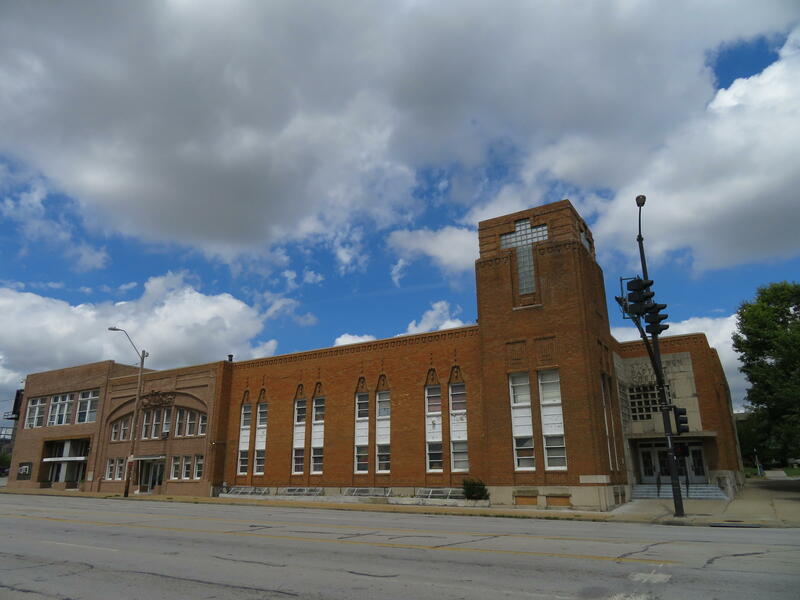 What is now St. Stephen Baptist Church was once a dance hall where Charlie Parker, Dizzy Gillespie, Benny Moten and other famous jazz musicians performed... and 1,500 people danced. Haddix: "Addie Parker and her son moved to a two-story brick house at 1516 Olive in 1932 and rented rooms out to borders to help make ends meet. In 1943 she bought a larger house at 1535 Olive." The 1500 block of Olive Street, where Charlie Parker's mother Addie lived in the 1930s and '40s. Parker moved to New York when he was 19, and died when he was 34 on March 12, 1955. Haddix: "Addie and his third wife Doris brought his body back to Kansas City, despite the objection of his fourth wife Chan. Addie buried Charlie under a tree in Lincoln Cemetery, so he would be cool in the summer. Addie rests next to Charlie." A few of the young saxophonists who played at the annual 21-Sax Salute to Charlie Parker at Lincoln Cemetery in 2016. 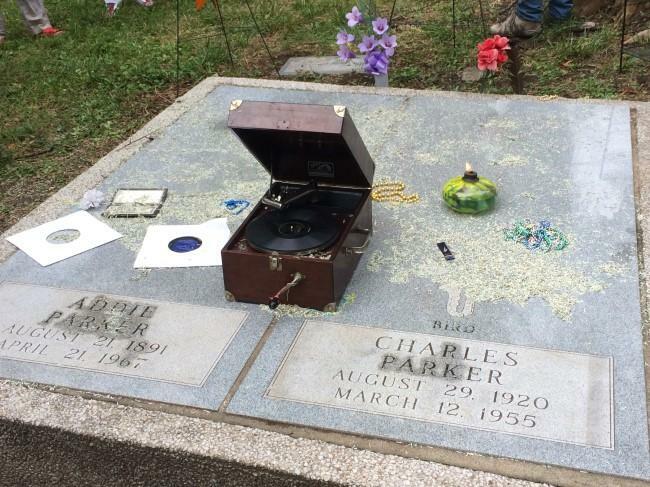 The annual "21 Sax Salute" at Parker's grave has been going on for decades — often involving instruments besides saxophones, and more than 21 musicians. As part of the celebration this year, Dan Thomas, associate director of jazz studies at the UMKC Conservatory, organized 21 sax players and mapped out a performance of several Parker tunes. 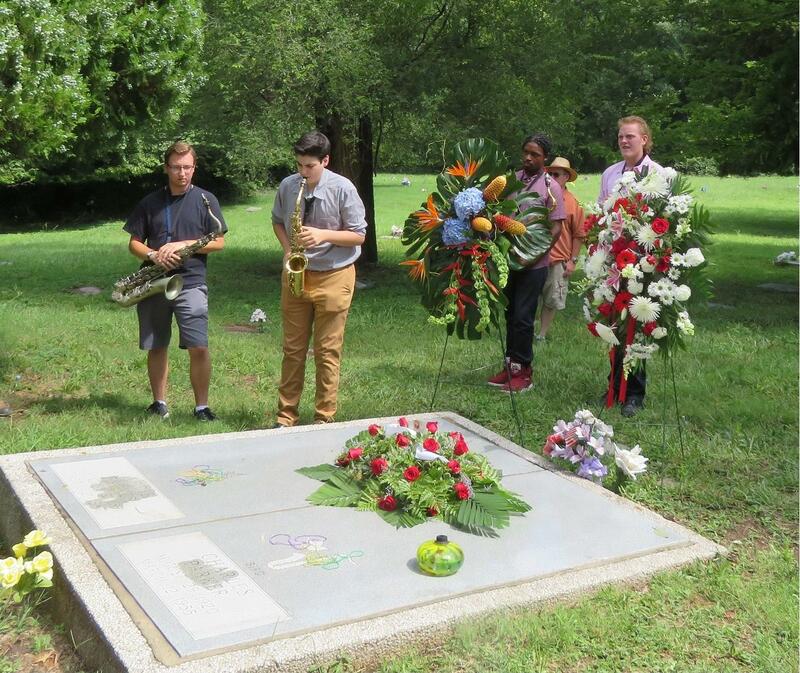 Many musicians, ranging from high school students to professionals, played at Lincoln Cemetery on August 27. Some of them are introduced during the performance, but many others are not. Listen to the music at Lincoln Cemetery on August 27, 2016. 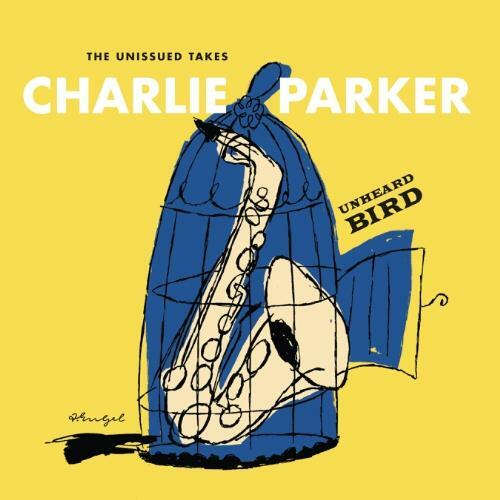 Sounding exasperated, someone in the studio production crew sighs “take three” after Charlie Parker’s imperfect version of “Passport,” one of 58 previously unreleased tracks on Unheard Bird: The Unissued Takes.